Numbered from the edition of 50. This work is hand signed by Joan Miró (Barcelona, 1893 - Palma, 1983) in pencil in the bottom center of the work. 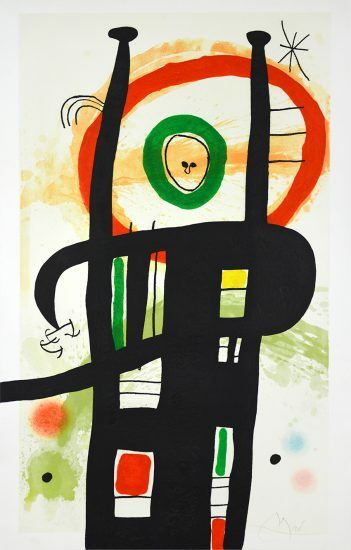 Joan Miró Le Chef des Équipages (Head of the Crew), 1973 features bold, bright lines intermixed with an array of greens, blues, reds, and yellows to create an amusing and whimsical character unique to Miró's œuvre of work. The composition extends on three sides to the edge of the paper, and with its grand scale, suggests this piece is bursting with energy and color. 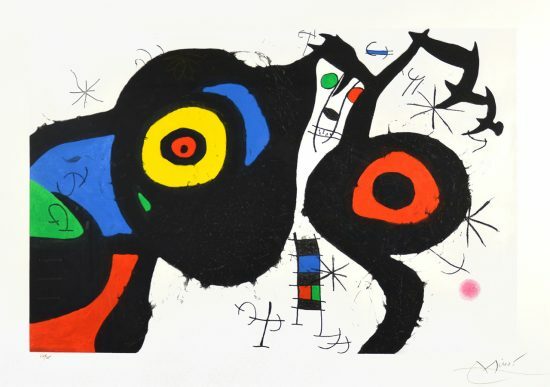 Inspired by a new engraving technique during the late 1960s, Miró begins to regain added enthusiasm with the production of his works as Le Chef des Équipages is a brilliantly colored and dramatic example of how he implemented these new styles, driving him to create a number of pieces during this period. 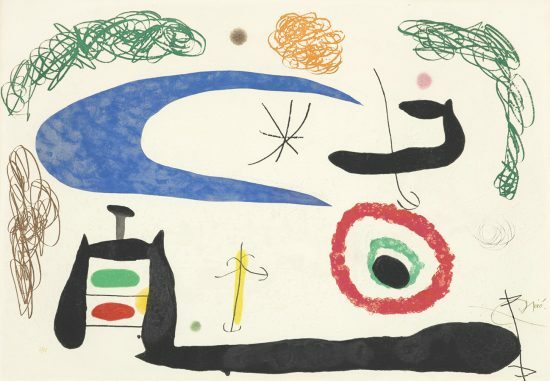 Created in 1973, this works is hand signed in pencil by Joan Miró (Barcelona, 1893 - Palma, 1983) in pencil in the bottom center and numbered from the edition of 50. Published by Maeght éditeur, Paris. "... the results are fascinating and very beautiful. The artist can express himself with more richness and freedom which give a beautiful substance and a more powerful line. Never did we get such a powerful substance before" (Dupin, 9). 1. Dupin, Jacques. 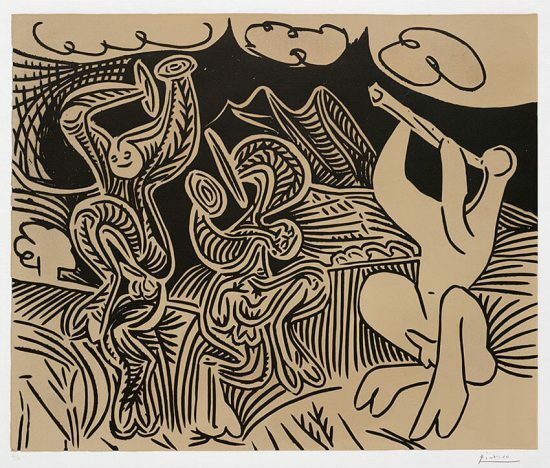 Miró Engraver, vol. II 1961-1973, New York, 1989. Listed and illustrated as cat. no. 574 on pg. 211. 2. 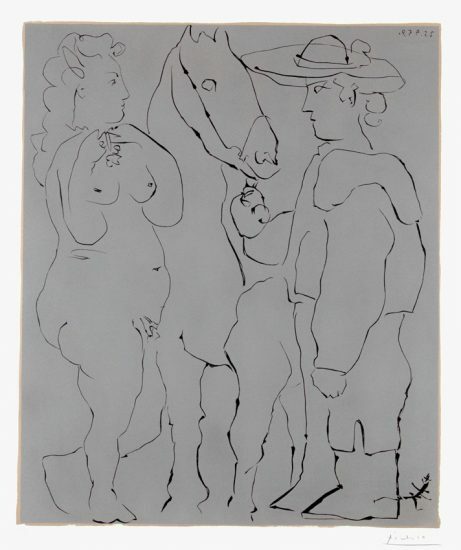 Maeght Éditeur, Lithographies Gravures Originales, 1985. Listed and illustrated on pg. 163. 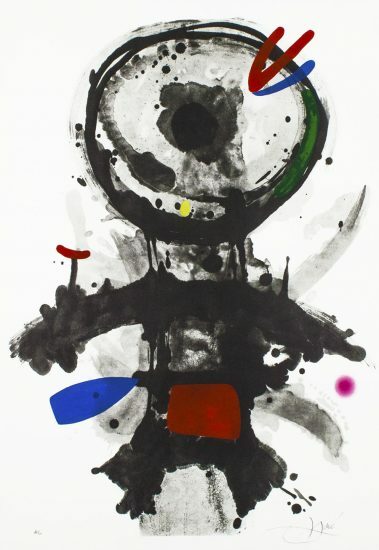 Joan Miró Head of the Crew (Le Chef des Équipages), 1973 is framed to museum-grade, conservation standards, presented in a complimentary moulding and finished with silk-wrapped mats and optical grade Plexiglas.